Of ancient origin, the rose is among the oldest of cultivated flowering plants. It was selected as the Queen of Flowers in Athens long before the beginning of the Christian era. Like the Madonna lily, the acanthus, the iris and other historic favorites, the rose has become a part of the rich heritage down through the ages. One has only to cite the story of the War of the Roses in which the white rose of York and the red rose of Lancaster figure. Today, those who cultivate old-time gardens revel in telling that romantic story which fascinated the poets of the late Middle Ages. At any rate the roses we know as York and Lancaster are greatly cherished by rosarians wherever roses can be grown. What Were King Midas' Roses? One wonders what types of roses were cultivated in those early times, which so aroused the enthusiasm of Solomon, Homer, and Sappho. They were apparently not the simple or wild roses of five petals like those in the gardens of King Midas as described by Herodotus about 450 B.C. The rose has always shown a marked tendency to multiply its petals and become double or semi-double, and it is probable that the ancients enjoyed double roses of beauty as well as fragrance. To trace the history of the rose, even in sketchy fashion, is a pleasant globe-trotting job. Locating the widely-spread homes of the species and early hybrids takes us from the ancient to the modern world. Rosa moschata, for example, grows in the wild state from Afghanistan to Kashmir at altitudes to 8000 feet and was first mentioned by the English herbalist Turner in 1551. The cabbage, or Provence rose, Rosa centifolia, was first described by Herodotus about 450 B.C., who stated that the flowers had approximately sixty petals, were very fragrant and grew in profusion in the area of Macedonia. We know it was introduced into Europe during the Renaissance since we find old records indicating it was cultivated in England about 1500. John Gerard included it in the list of species grown in his garden outside Holborn near London. Rosa centifolia mimosa, the moss rose, is believed to be a sport or mutation of the Provence rose. It has all the characteristic of its parent with the addition of the so-called moss on the sepals and stems, giving the bud a truly mossy appearance. In Central and Southern Europe reaching Eastward toward the Caucasus, Rosa gallica appears in the wild state. The raising of this type from seed was practiced by Dutch nurserymen to a large extent, principally during the early 18th century. 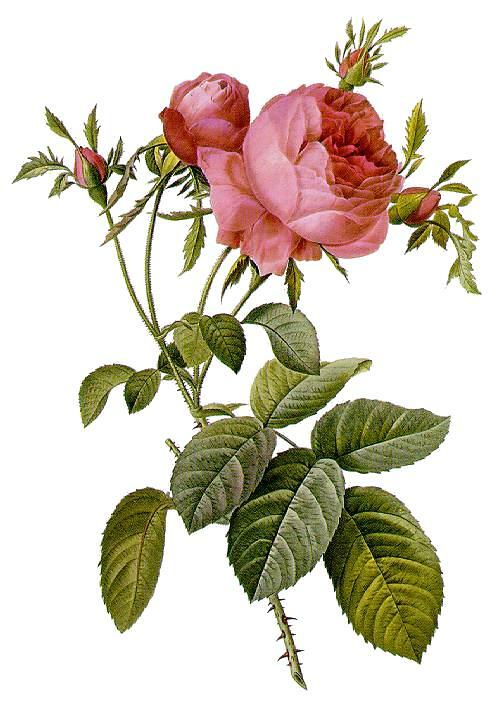 The famous flower painter Pierre-Joseph Redouté first mentioned the Bourbon rose in 1824 as having originated on the Isle of Bourbon. In 1843 Deluxe of Lyons, France introduced the variety Souvenir de la Malmaison, which is still a favorite. Similar in form is Rosa chinensis, collected by Robert Fortune during his travels in China about 1840. Both these types have somewhat small, double blooms of pleasant fragrance. A familiar denizen of the seaside is the sturdy Rosa rugosa which was introduced to England from Japan in 1784. In the years that followed, this species has been crossed with other types and has produced hybrids of great value for use in cold, windswept areas. Although they have been largely replaced by the hybrid teas and the floribundas, the hybrid perpetuals were introduced nearly two centuries ago. Contrary to notions held by some beginning rose growers, hybrid perpetual does not mean that the plant flowers continually, but rather that it is long-lived and very hardy. Many rosarians consider these the typical old-time June roses since they produce abundant bloom of notable fragrance and fine substance. Many varieties bloom a second time in the Autumn. Many of the modern climbers and the trailing roses have wichuraiana blood in them. Rosa wichuraiana was brought from Japan by a German botanist and cultivated in Europe about 1887 in the Botanic Gardens of Brussels. Commonly known as the memorial rose, it is most useful for covering banks and as a climbing rose is quite hardy and worthwhile in many ways. There are many other types of roses best known to collectors. Suffice it to say that there is a rose for almost every purpose, either among the species or the hybrids. The culture of the rose is relatively simple and not nearly as difficult as old-time books and catalogs used to insist on making it. This is especially true with the introduction and caring for knockout roses. The main essentials are good plants, well-drained, loamy soil rather on the heavy side, good drainage and free circulation of air. The soil should not be strongly acid since few roses grow well in it. In preparing the bed for roses, well-rotted, barnyard manure, humus, or compost should be worked into the soil, since roses are heavy feeders. To secure still better results, after the plants are established, feed them periodically with either with liquid manure water or any good commercial fertilizer. A small amount of bone meal and coffee grounds worked into the beds when preparing them is also beneficial. However, do not feed roses after early August, since this may induce soft growth and cause the plants to be frozen out during the ensuing Winter. Naturally, keeping the plants watered and the ground weeded is important. Since fungus is spread by water, it is good policy to water as close to the soil as possible so that the spores which may be on the ground, are not splashed onto the foliage. There are special tools available like using a soaker hose under mulch to do an excellent watering job. A light covering of mulch over the beds will discourage weeds, keep the roots of the plants cool and make frequent watering unnecessary. Roses are subject to insect pests and diseases, but no more so than many other types of plants. In late years, the magic of the research chemists has played a large part in making it easier for plant lovers to keep their roses free from these injurious pests and diseases. With the advent of modern insecticides and some or the recent fungicides, much of the difficulty has been overcome. There are available today combinations in both liquid and dust forms of fungicides and insecticides which are easy to apply and inexpensive. A word of warning to those of us who are inclined to be a little impatient. Do not expect climbing and shrub roses to produce abundant masses of blooms the first Summer after planting. In the case of many climbing varieties which bloom on the canes made the previous year, good growth of canes must be encouraged for ample bloom the following year. 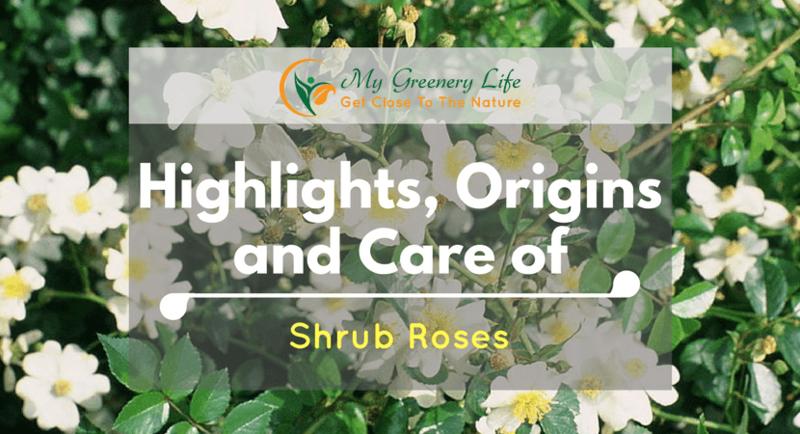 Shrub roses also need to become thoroughly established before they reward you with their prolific and tempting blooms.